If you are beginning to plan your Sunderland wedding, you have come to the right place! North East Wedding Band Funk Conspiracy are here to tell you about Sunderland’s history. Ease some of your wedding woes by using this page as a guide to Sunderland’s finest wedding venues, hotels, restaurants and top visitor attractions. Book Funk Conspiracy as your Sunderland wedding band, we provide a professional service and create a fantastic atmosphere that your guests will relish and will turn your special day into a dream come true. Now relax and use our definitive Sunderland wedding guide to ensure everything falls into place…..
Seaham Hall is located south of Sunderland bordering Durham. It’s a five star luxury hotel and spa on a clifftop overlooking the sea. If it’s a bespoke, luxurious and unforgettable Sunderland wedding you are after, then Seaham Hall is the location to choose for your special day. The Sunderland Marriott is four star luxury hotel near the city centre in Sunderland. Expect everything you should from a typical Marriott hotel, in a beautiful sea-front location. If you are planning a more modern Sunderland wedding, go for the Roker Hotel . This is a Best Western hotel with an enviable location overlooking the North Sea, and with beautiful banqueting room, this really is a place to celebrate in style! 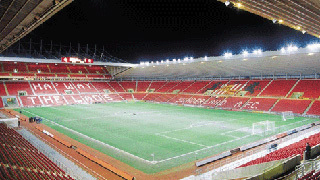 If you fancy something a bit different, how about The Stadium of Light? This is Sunderland’s football ground and they have various packages to suit all budgets and tastes. It’s certainly a unique backdrop, and if you’re a football fan it’s an ideal location for your dream Sunderland wedding! Serendipity is a cosy little tea room with a charming vintage style. large selection of teas and home-made biscuits and tasty treats, this is the perfect place to pop in for a stylish cuppa! Or have some Thai cuisine in Thai Manor, a beautiful restaurant in the redeveloped Sunniside part of Sunderland. If you feeling more European, try Angelo’s, an authentic Italian restaurant in a grade II listed building in the town centre. You can even hire the venue for a wedding party! Sunderland Aquatic Centre opened on the 18th April 2008. 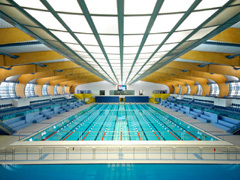 The construction cost around £20 million, and it is the only Olympic sized 50m pool between Leeds and Edinburgh, making it the largest swimming pool in the North East. It boasts six diving boards, which stand at 1 m, 3 m and 5 m. Other notable attractions for visitors to Sunderland include the 14th century Hylton Castle and the beaches of Roker and Seaburn. The Funk Conspiracy Sunderland wedding guide was written by Navella Caretto.